This is definitely the most preferable choice for a type of flower arrangement. A flower bouquet or a hand bouquet is so beautiful and can be easily bring, able to spoil anyone’s heart who receive it for sure. 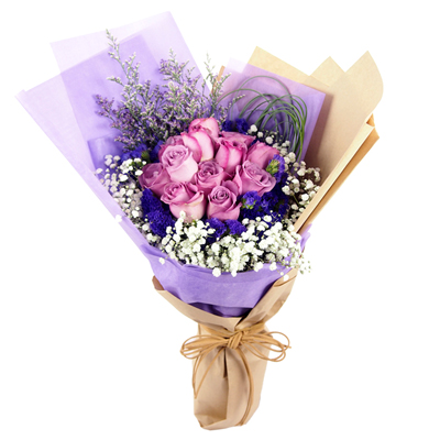 A flower arrangement of hand bouquet from a florist Singapore can be your best choice as a gift for a date and such things. Flowers vase is another popular choice of flower arrangement for sure. A beautiful arrangement of flowers in a vase is certainly a nice thing to buy to decorate your home or to add such a beauty in your home. 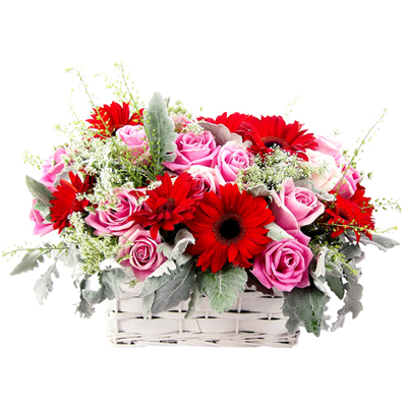 A flower basket might not very popular for a flower arrangement, but they can certainly be a beautiful gift to give too since they can look really classic and appealing as well. 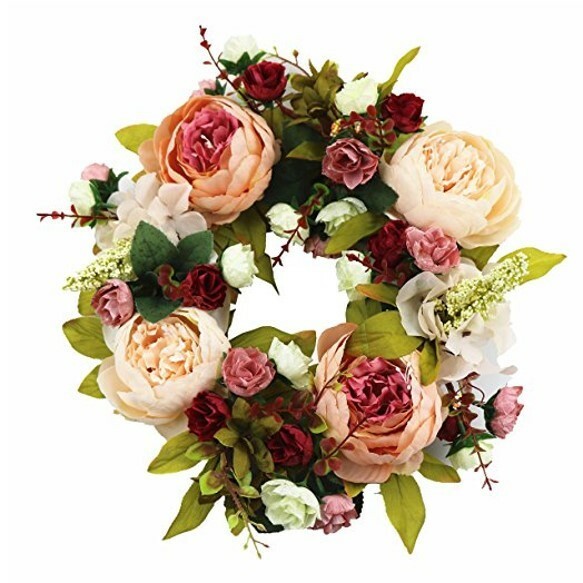 A flower wreath can be used for a beautiful accessory and decoration as well. Every girl will surely look beautiful when there is a flower wreath of a flower crown on the head. After all, flowers will always look beautiful no matter what is the form of their arrangement as long as you can arrange them well. 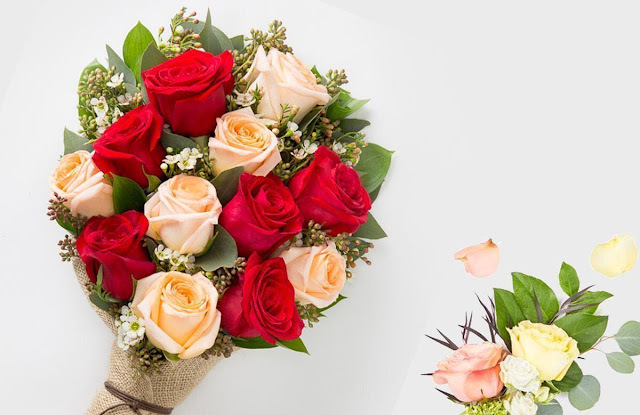 The florist along with their online flower delivery service will always be there to help you easily get the best flower arrangement, though. Just make your order now to prove it. Everyone wants their most special day of a lifetime to be beautified with gorgeous flower arrangements. The more flowers, the better, but it takes a lot of time and research to actually plan a wedding, let alone choose the right kind of flowers. If you want to know what to focus on when it comes to weddings, and which flower arrangements are crucial for your wedding venue, keep on reading. Before you even contact a florist with flower requests do some research on your own. It will make your florist’s job a lot easier and faster, and your vision is more likely to come to life if you know exactly what you want. Do some research, scroll through some wedding pictures, decide what you like and don’t like and then talk it out with your florist. Everyone wants to make their venue slightly more luxurious and extravagant with flowers, but do consider the venue when choosing the flowers. Different settings require different flowers, as with the right flowers, you’re able to create the ideal and unique setting for your wedding. A wedding in the country might ask for different types of blooms than a beach wedding would for example. Don’t be shy and bring as many pictures as you can. Show your florists what you like and don’t like, don’t just try to tell them. You probably don’t use the same professional vocabulary as a florist would, and you probably can’t explain every single details the way you should. So, in order to avoid a wedding disaster, create a mood board, bring pictures, pin wedding flowers and share it with your florist. It’s okay to have a dream about which kind of flowers you want to carry while walking down the aisle, but sometimes those flowers are just not in season. Be prepared for compromising, and listening to what your florist has to recommend. 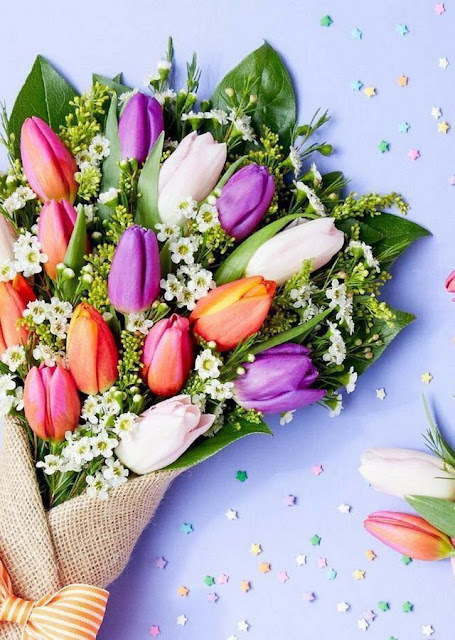 Even if you stumble upon a problem with flowers, there’s always a backup plan and flower lookalikes that your florists will suggest. The truth is, not all florists are the same. They don’t think the same and they definitely don’t charge the same. Ask around and see which florist seems the most creative and affordable one, and will fit your budget. It’s important to do your florist research above all, so that you can achieve everything you’ve planned out. Add something personal to every arrangement and bouquet. While flowers are beautiful, you want to add a meaning to them. Add details that tell your story and that represent who you are and what you like. 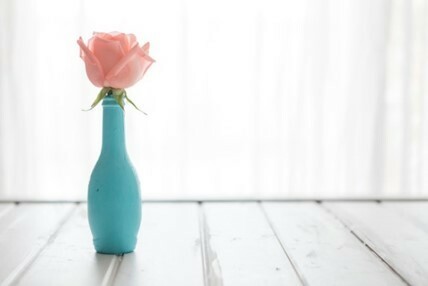 That way, you’ll make memorable flower décor. Flower bouquets and arrangements are the most common choices when it comes to design, but there are so many other ways to decorate your venue with besides arrangements. Think outside of the box and opt for authentic flower decorations like flower chandeliers, flower brooches for chairs, flower backdrops for taking pictures etc. With the help of the right florist, this will all be a piece of cake. But you play a great part as well, so make sure you do your homework before you sit down for a chat with your favorite florist. Well. I was so so so excited when Nippon Paint offered to paint Carissa's room. I was so determined to decorate this room as girly as possible! Ditch the purple and blue colour! We fixed an appointment with Nippon Paint and Alan, the inspector came for a site inspection. Ours was rather a simple one. He was actually pretty surprised to see how empty our room was. Hahaha. Nippon Paint has many different type of interior paints - Honestly I never knew that at all. They come in a vast spectrum of classic and contemporary colour wall paints, with finishes ranging from matt to glossy. They also come with specialised paints include easy-to-wash coatings and anti-bacterial paints that protect our family as well as our wall from harm. For my case, we chose Nippon Paint Odour-less All-in-1 (Matt Finish). It is one of the commonly use and ideal interior wall paint for homeowners who want the best all-in-one multi-functional paint. For the next 30 minutes, Alan guided us in choosing the paint colour. For an i ndecisive person like me, I would have probably died in this sector because I JUST COULDN'T MAKE UP MY MIND! Alan brought us the Nippon Paint Catalogue. There is an online version which you can get it here. There was one thing that I am determined in getting was the STRIPED PAINTED WALL. I thought this will kill them because I know this would definitely take up a lot of time and of course, skills required. Hehe! But Alan was totally supportive with my idea! Not only that, he even added on more ideas! THANK YOU! As you know, the ultimate aim is to transform into a girly room! Therefore, PINK is my ideal choice. 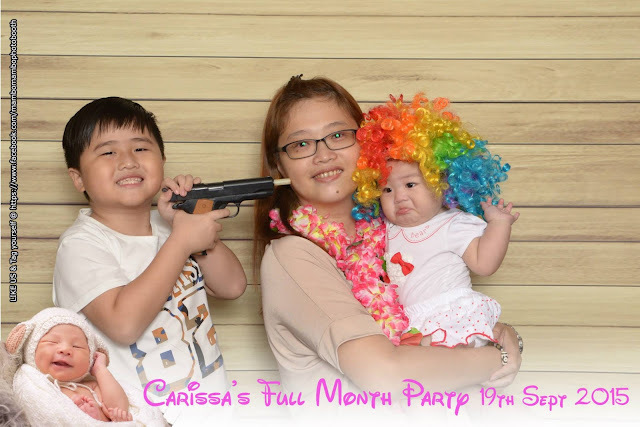 (Honestly, I was not a pink person before I had Carissa.) 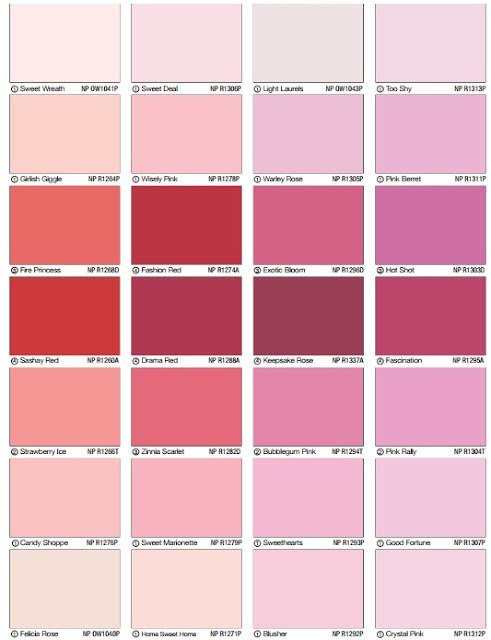 It just freaked me out when they have different shade of pink for us to choose. We really had a hard time with all the pinks but Alan really helped us in choosing the right colour. Inspection of the room, explanation of the painting process and choosing of colours were all done within an hour. Phew! If you have been following in my instagram, probably you have already caught a glimpse on that striped wall which I have posted on that day. Stay tuned! I FINALLY CHOPPED MY HAIR! My hair was ridiculously long and a little messy I would say. Frizzy at the bottom, dry - just very messy! Hahaha! Finally, I "managed" to chop it off. Yay! If you have noticed, there are many people having the inspired hair style by Song Hye Kyo in DOTS drama. Shamelessly! Me too, went ahead to imitate the style of it - Not exactly the same. HAHAHA! Sharon from Salon De Choix encouraged me to cut see-through bangs and shorter. Really like Song Hye Kyo. But really, I am so afraid that I can't carry bangs! Well, I couldn't achieve her hairstyle or rather I do not have the guts to do that. But if you are still into having Song Hye Kyo's hairstyle. Here are some tips that I have read from the other website! How to achieve Song Hye Kyo's hairstyle? Back to myself, I have chopped off about 15 - 17cm - Yes, my hair was really that long! And here is the fresher look . 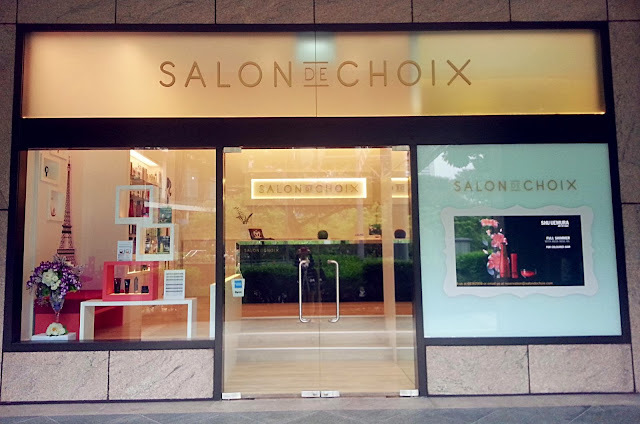 For those who are interested and looking for a trusted hair salon, do visit Salon De Choix! Oh yah, don't forget to quote "Katty" to entitle 15% OFF! for all the treatments. 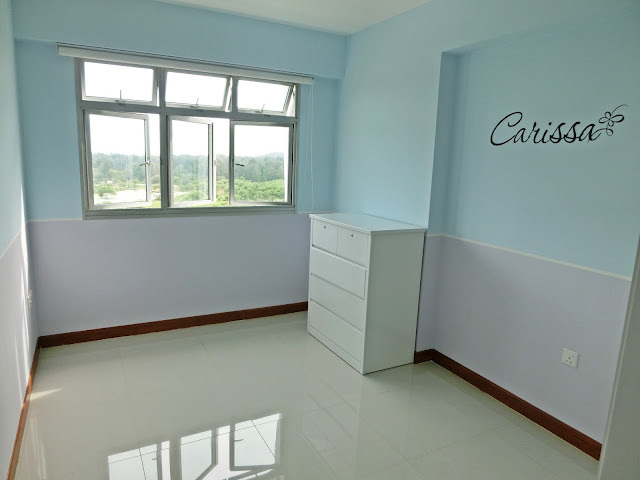 Address: 3 Killiney Road #01-06 Winsland House 1 Singapore 23951 (Just few minutes walking distance from Somerset MRT). Do remember to call 6836 2959 to make your appointment! 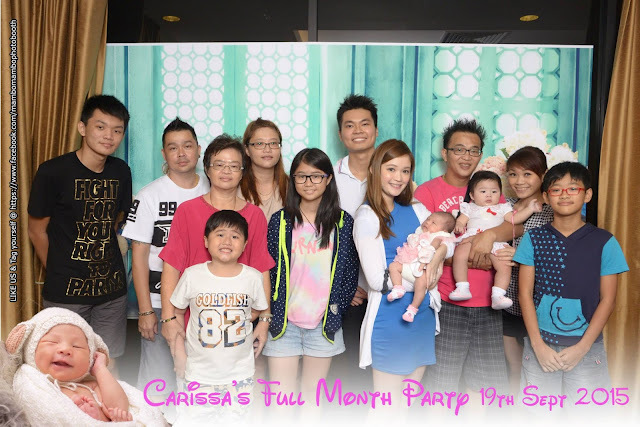 It never came across our mind that we have to start searching for venue to hold Carissa's baby shower before her arrival. Well, probably we did not expect her to come out 2 weeks earlier as well. So during the first month, we were fanatically looking for the right venue. From restaurants to function rooms. 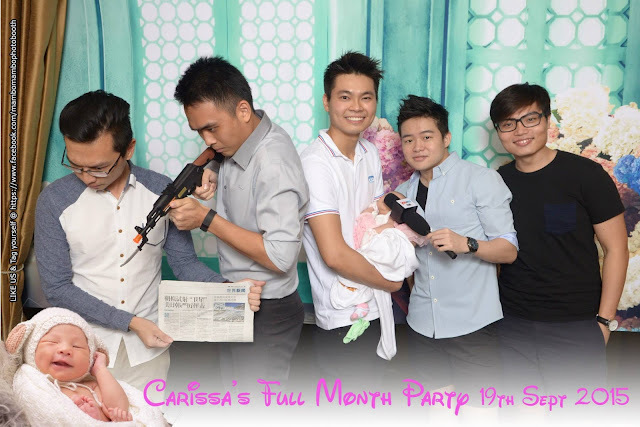 In the end, we decided to hold it at SAFRA Tampines on the 19 September 2015 - Yeah man. This was a super backdated post. Pretty upset that we missed out their SG50 babies promotion. I heard that it was so cheap! But anyway, I wasn't aware of it. The rental of the venue was about $1,000 (This was the 2015 price.) It was pretty spacious and can fit up to 10 round tables. Other than that, most of our relatives commented that it was quite accessible with direct bus stopping right outside SAFRA Tampines. As for buffet, we had Neo Garden catering. 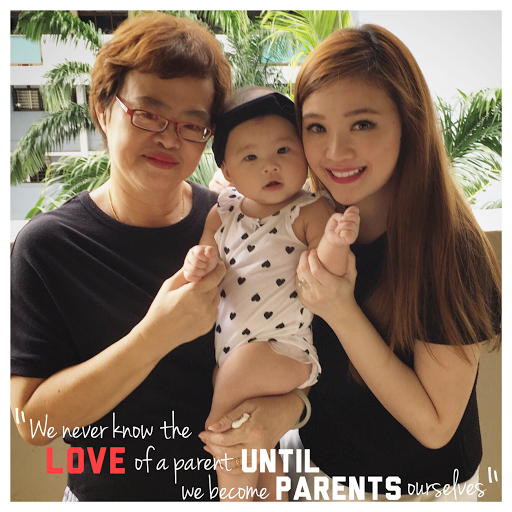 We were really blessed to have a SG50 baby as they are having 50% for all SG50 babies. SG50 babies have a lot of perks actually. Horray! Instead of the usual photo taking, we had engaged MamboStevie Photography Mo-works for their photo booth services. I guess photo booth is always popular every where! Be in weddings, birthdays, corporate events and etc. Specially thanks Stevie for giving us extra perks by bringing down extra backdrops and props! Even if you need photography or even videography service, you can look for them as well! Talking about the venue, it was really spacious! It was big enough to hold a photobooth corner or even bouncy castle! We specially love this sweet heartshape backdrop! Look at the props that they provided! 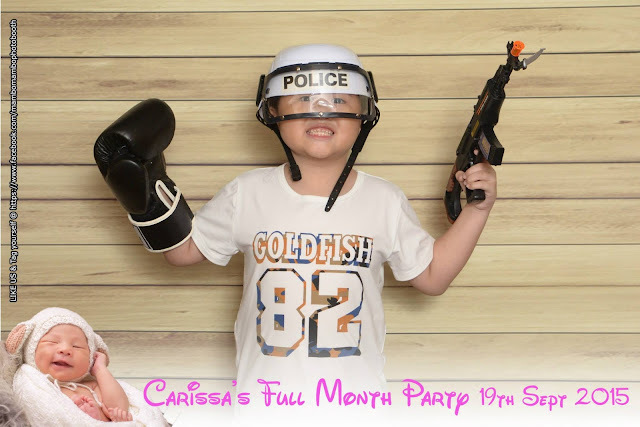 All the kids have so much fun with their props! An enchanted garden theme backdrop. Not much photographs were taken on that day because we were so busy entertaining the guests. It was really a mad rush for us. Lots of hiccup with the decoration and stuffs. 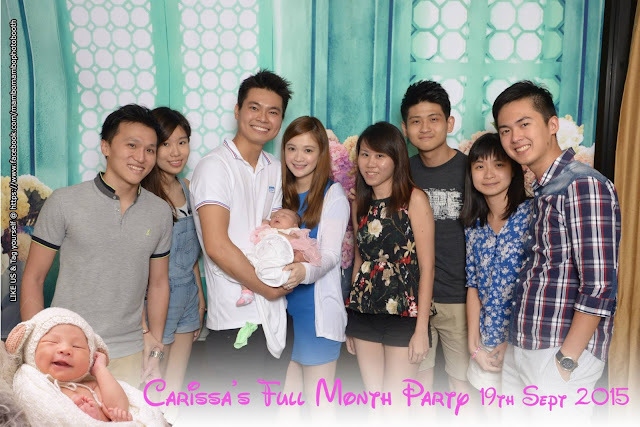 After all, it was our first time officially bringing Carissa out. Hahaha! It was a great experience. 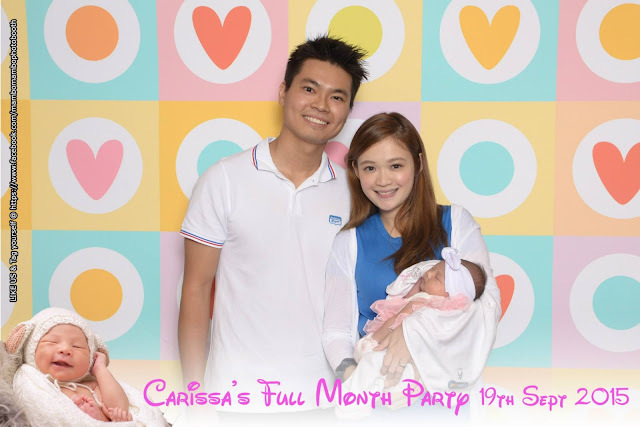 Thank you again to all our relatives, friends and colleagues who specially take their time down to attend Carrisa's baby shower. Love you all! There are a lot of confinement rules and regulations myths. As much as we youngsters are dread to follow them, most of the time we have no choice...but to follow. And yeap, I followed most of them as I do not want to get regret in the future. #kiasumama Hahaha! I will not be sharing the details of my 40-days, but just some general stuffs. During my confinement, the weather was so crazily hot and humid. If I did not remember wrongly, it rained less than three times for the entire month! Not forgetting the haze! It was like a torture to me. Specially when I am those kind of person that I need to bathe twice a day. Thinking back, I wondered how I actually made it. Some people will do it for 12 days, 2 weeks or even a month. So I had to make myself think that I'm more fortunate in this case. Even though it was just a week, it really seems like forever to me. Everyday I was counting down. It was really insane. My body was so sticky and my hair was so oily! THE OILIEST OF MY LIFE! I could tied them up (including my fringe) so "neatly" and it really seems like I have used a lot hair wax or hair spray on them. 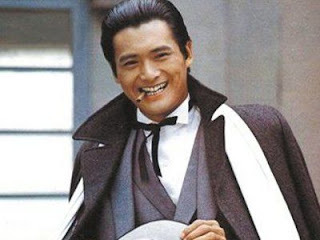 Sorry Chow Yun Fat, but I have to use you as my example! My hair smelt so bad to the extend that Daddy Chang said he could smell me whenever I walked past him! Like wtf. I felt so inferior when I had to go for check up in such a state of messiness. *Roll eyes* When comes to bathing, I was not allow to use normal water to bathe. My mum had to boil a pail of "herb water". (The temperature of the water has to be very hot. ) This herb can be easily purchase in all TMCs. It wasn't easy for her as well. ANDDDDDDD the water was in dark brown water! Not different from the longkang water! I mean the colour! But well, at that point you wouldn't really care at all. All you want to do IS TO BATHE! AND YOU HAVE TO BATHE SUPER FAST. Like wtf, the water is burning my skin! Lastly...it doesn't cool you down either. I ended up perspiring even more. My mum had to take care of these little details. Even washing of hands, my mum had to mix warm water and rice water for me. Yes. No tap water! All the washing of the milk bottles were done by Daddy Chang and my mum. I was not allowed to bathe #lilbabychang as well. And oh, in case you don't know. I was not allowed to drink plain water as well. Nothing but ginger red date tea. To the extend that there were times where I even craved for plain water. This is funny uh? My mum mentioned that we are not allowed to go hungry, go on diet or even consumed food that are cold. She asked me to eat as much as I can during this period. No diet! She whipped up very nice meals for me every single day. So I totally have no complain for the food at all. Hehehe! I enjoyed all of them except that i have to eat fried ginger and drink ginger red dates tea for all meals. 5. Do nothing but rest well. I was ordered to keep resting! No matter I am awake or not, I have to lie on the bed most of the times. It was pretty boring uh. I wore long sleeve and long pants every single day. Only in the day I was allowed to change to T-shirt. At night I have to sleep with jacket on and I have to wear socks. But the good thing is that I was allowed to sleep in air conditioned room. Hahaha! But well, I still perspired in the room anyway. Every morning and night I was asked to drink tonic. Be in chicken essence, bird nests or some black, yucky herbal tonic. I drank them all up. My mum warned me that I MUST not shed any tears during confinement. The olden people said that tearing is very bad for our eyes -I don't know how true it is. But sometimes, tearing is just unavoidable...I know right. She said it will be bad for my womb as I was still recovering. It became a habit that I did not squat for so many months! HAHA! She mentioned that it was something link to my bladder and womb. So whenever I have to drink water, I always have to find somewhere to sit. Hahaha! These 10 are the basic that I have followed. Do not ask for the reasons behind each "rules" as some "rules" will really make you roll your eyes. They always have their own reasoning, so don't fight with them. Hahahaha! I was quite relieved that I opt out breastfeeding. Honestly, I do not wish to add any stress during this confinement. My little one is cranky most of the time - I think probably she is trying to get use to it and she suffered from reflux issue. Milk regurgitated regularly. So worried that she might get choked in her sleep. I almost went crazy during the first month. Thank god, I am not alone. I have support from my husband and my mum. Not to mention, I am still suffering from episiotomy stitches. The pain came when I sit, stand or even lie down. Gosh! My health was not good to start with. My mum did her best to gain back my health and I have to do my part to absorb all of them. Kudos to all the new mummies! We all did well! I will be sharing the nightmare of the fourth trimester real soon. Just remember a golden rule during confinement: "Stress-free! Be happy!". Phew! I am glad that I survived that 40-days. I haven’t been actively blogging. But trust me, I'll be back with all the backdated post. It has been almost 7 months ever since I became a Mom. Well, life has drastically changed since then. No more late night outing. No more, not that much travelling. No more splurging on unnessary stuffs and etc. But with #lilbabychang's arrival, I must say she had made us a better person and matured at the same time. Well, we weren't perfect parents. We made mistakes. We learn as she grows. In fact, every day with her is a new experience and learning journey for us. 1. I bathe in 5 minutes. In the past, I used to bathe like 20 minutes? I wondered why I couldn't do it in the past. You know, to the extend that I can bathe so sneakily while she is asleep. 2. I know how to eat with one hand. That's because the other hand is holding her. I can even eat while patting her to sleep. A whole new level. 3. Not forgetting, I can gobble up the food in 5 minutes. Daddy Chang used to be the first who finished up his meal every single time. But now, we can compete with each other on that! 4. I/We visit Children Department more than other departments. Cosmetic shops? Clothes? Electronics? Bags? Not anymore. We realised we will walk into children stores/sections unknowingly. 5. My eyes widen when I see promotions! When department stores are having store wide discounts, the first thing I thought of will be baby products. Gosh. 6. And it's all about baby fairs. After becoming parents, we realised there are just so many baby fairs! Did we even notice that in the past? Or are there even baby fairs? Still, we will always visit the baby fairs and ended up spending hundred over bucks on baby products. 7. Bag to match my ootd? Sorry, I only have diaper bag. I am so lazy to bring my own bag along. Bringing two bags out? Crazy, I rather stuff my wallet in the diaper bag. No make up pouch, no perfume. Just wallet. 8. I became a super light sleeper. I get awaken even when she flips or even when the slightest snore that she made. Sometimes I wonder if I did sleep through the night. 9. I can do make up in 10 minutes. Probably I should indicate that it is a light make up. But still, it was never in the past. 10. I/We became a morning person. I/We used to sleep away my/our weekend. But now, waking up at 9am is consider a blessing. 11. We have no idea of what's the latest trend song. It is amusing that we even caught each other humming lullabies out of sudden. Just imagine, Daddy Chang was humming "Daddy's finger, Daddy's finger where are you" while he was mopping the floor. Omg. We are poisoned! 12. I'm so into pink now! I am never a pink person if you know me. But after having #lilbabychang, pink has became one of my favourite colour! Daddy Chang was so pissed off when he asked me to choose the mahjong tiles colour and I chose pink! It was really nice what! 13. I get paranoid easily. "Why does she keep crying?" "Why doesn't she drink milk? "Why doesn't she poop today?" "Is she unwell?" "Why are there red spots on her face/hands/legs?" There are infinite "Whys". Thus, Google has became my Best Friend. 14. I level up my multi-task skill. I am a multi-task person. But after becoming a Mom, I realised I can do even more. I can cook, wash the laundry, dry the laundry, tidy up the house, entertain #lilbabychang, made her sleep...at one time. Like wow! Even Daddy Chang is impressed. 15. Phone or camera are always within my reach! That's because I want to capture all her milestones! Her first flip, her first smile, her first pout, her first food and many more! 16. Officially an obsessed parents. To the extend that I upgraded my 16GB iPhone to 64GB because memory is always full! I hate it when I have to transfer them to my hard disk. And I actually created an Instagram account for her - @lilcarissays. 17. Baby will always be the topic. I get really excited when people ask me about her or whenever we are in the baby topic. Being an obsessed parents, I want to share every single thing. So friends, please stop me if I can't stop blabbering. 18. The ninja moves. It specially works when she is sleeping. See the video below for more illustration. 19. Doing baby talk or baby dance. In the past, I/we might find it embarrassed to do so. But now, this has become part and parcel. We wouldn't even mind doing all these in the public. Specially if this can calm her down. Why not? 20. Respect and appreciate. After becoming a mom, it made me respect my mom and love her even more. It wasn't easy raising a child. Moreover she had 3! Sometimes I wondered how she managed to do it. Now that I'm a mom, it made me understand her unconditional love towards the three of us. Her constant worries and her caring throughout these years. Her selfless love towards us and her sacrifices she had made. It also made me realise why a Mother can put her children above every single thing. Nothing can ever replace a Mother's love.And of course, everything cannot be complete without Daddy as well.